A very interesting and controversial study emerged recently, comparing nuclear and solar costs no less. The study, “Solar and Nuclear Costs – The Historic Crossover“, was prepared by John O. Blackburn and Sam Cunningham for NC Warn, a climate change nonprofit watchdog. The paper, focused on the costs of electricity in North Carolina (US), describes the solar photovoltaics (PV) business, summarising its history of sharply declining prices, along with the very different path taken in recent years by nuclear power, whose costs have been steadily rising. 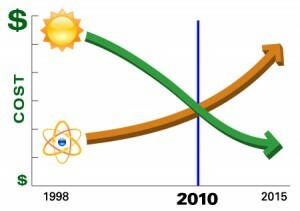 The conclusion is that as of 2010, North Carolina is witnessing a historic crossover between the price of nuclear power and that of solar PV: the crossover is said to be happening at 0.16 $/kWh. Very important note: these costs are calculated as net figures after subsidies. Where do the numbers come from? The study collected figures from local solar industry sources, to come up with a “capital cost” for solar PV electricity, and relied on a study on nuclear price trends by Mark Cooper, “The Economics of Nuclear Reactors: Renaissance or Relapse?“, for a comparison with nuclear power. The “net prices” are then obtained by deducting from those “capital costs” whatever forms of subsidies, rebates and tax credits are available in the US. This means the conclusions of such study are not about a Levelized Cost Of Electricity (LCOE) comparison, but rather about the final cost to consumers, given the existing incentives. A lot of discussion could be triggered by the method alone, as its results are heavily dependent on the local level of support to either technology. Nonetheless, there are much more interesting data from this paper than just its controversial conclusions. Capital costs of both sources of energy (before subsidies, a sort of levelized cost) are indeed discussed, but what is even more interesting (and as yet most unnoticed by the media) is the scale of the comparison. We’ll see why. The figures shown for solar energy are explained in the report’s appendix, and calculated for a very small 3kW (peak) PV system with the following parameters: $6,000/kW installed cost, 6% borrowing rate, 25-year amortization period, 18% capacity factor (meaning 1,560 kWh/kWp per year), and a 15% derating factor to account for system losses. From these values, a capital cost of 35¢/kWh results as the current electricity price of a residential PV installation. Then, by taking into account the 30% and 35% Federal and state tax credits (yielding a net system cost of $8,190 from the original $18.000), the authors calculate a net production cost of 15.9¢/kWh. On the other side, nuclear power costs from new projects under construction or planning around the world are estimated in the region of 12–20$¢/kWhat the plant site, before any transmission charges. Transmission and distribution costs – the authors argue – would raise the delivered costs of new nuclear plants to residential customers to 22¢/kWh. According to the authors, plant cost escalations announced by utilities since Cooper’s paper was published suggest an even higher figure, but 16¢/kWh is eventually considered as a mid-range value, also net of available subsidies, for comparison to the calculated costs of a small residential PV plant. That’s the crossover point. This study, and its conclusions, have caused reactions of all kinds, and weighing in subsidies hasn’t helped finding common ground between advocates of the two different technologies. One response that really drew my attention though, is that from the Italian Nuclear Association (AIN), member of the European Atomic Forum (FORATOM), the American Nuclear Society (ANS) and the European Nuclear Society (ENS). In an official note through the italian media, they point at the use of subsidies as a deceitful means to get to wrong conclusions in favour of PV. Not happy with this, AIN also suggests that the real capital cost of a 3kW PV system would be around 63¢/kWh! As an end to the official response, the nuclear association clarifies what the real costs are for modern nuclear plants under construction: 10 to 15¢/kWh. I find their response even more intriguing than the study itself. Now, I won’t go in further detail on the issue of subsidies, as I believe that a proper apple-to-apple comparison should be that of levelized costs. This said, I think the study’s results are indeed a bit deceiving, but actually not so much to PV’s advantage. The nuclear association’s official response only adds an amusing note to this clash of the numbers. Why do I suggest that? well, let’s go back to the start. A small residential PV system with a peak output of 3kW is being compared to the figures of a huge centralised nuclear plant (new designs like the EPR reactor have a 1600MW output), some 500,000 times (!) greater in terms of power output (and even more in terms of annual generation, given the different load factors). This is David Vs Goliath. While I can understand the reasons behind this choice by the authors (aiming at final electricity customers of North Carolina), if a proper comparison were to be made that should be between levelized costs (LCOE) of utility-scale plants on both sides. In this scenario, we find that bigger solar plants, even just at a 100kW rating, already achieve levelized costs below 20¢/kWh in sunny regions (like southern Europe or a good part of the US), with system prices already below €3,000/kW as of Q2 2010 (as witnessed by the German Solar Energy Association BSW). The influential website Solarbuzz posts regularly updated figures on electricity costs for 100kW roof-mounted plants: August surveys show a figure of 19.14¢/kWh. Multi-MW plants, clearly benefiting from some economies of scale with installaton costs now around €2,500/kW, are already in the 15¢/kWh ballpark without the aid of any incentives. So what about the Italian Nuclear Association’s claims? Their 63¢/kWh figure for a residential PV plant is based on a load factor of 10%, something achievable even under the skies of London and hardly comparable with North Carolina or any sun-friendly region on Earth. Spain and southern Italy can easily achieve 16-18% load factors, sunny States in the US go even higher. Obviously, AIN dare not suggest a comparison with utility-scale PV projects. But they do end giving us an outstanding piece of information. New nuclear appears to have costs up to 15¢/kWh. I don’t recall any ufficial nuclear body admitting such high figures before, but it’s good to finally get some clear numbers after the worrying reports published by the likes of Moody’s and Citi Group in their recent due-diligence on nuclear power. Granted, it may well be that costs for those badly over-running construction sites like the European EPR plants in Finland and France will be even higher, which helps explaining the increasing requests of late for subsidies, incentives and loan guarantees made by nuclear utilities. 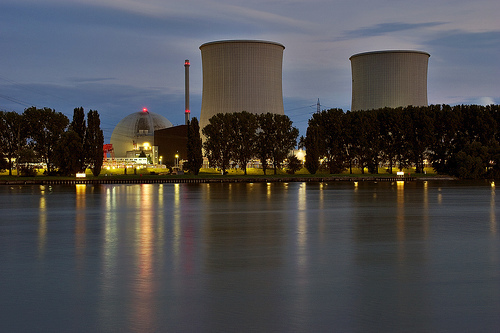 Gone are the days when claimed levelized costs for nuclear power were about 3-4¢/kWh; it now seems nuclear projects in the developed world will not be completed without a big helping hand from governments and taxpayers. In a business where quick-to-install, modular renewables like PV are outpacing all economic projections and show costs decreasing by the month (triggered by plummeting incentives and ever higher production volumes), the economic outlook for the once proudly cheap nuclear energy has never been as bleak. This entry was posted in Clean Energy, Gotta Be Kidding, Nuclear Energy. Bookmark the permalink. I see that the editorial team at Climate Spectator deleted my criticism of your sockpuppeting. Must be nice to have them on your side. It certainly helps in avoiding those uncomfortable questions a less biased editor might choose to pick you up on. Hard to see any “sockpuppeting”, as you like to call it, when real world numbers are given on both sides. Why don’t you object figures with some evidence (and not old documents or would-be scenarios)? I guess you don’t like them even if they come from the nuclear industry? As to your “conspiracy theories”, my only interaction with Climate Spectator is that they take my posts and publish them with my permission. I myself had to register on their site as anybody else, in order to post my comments. Too hard to believe? I don’t know what your specific comment was about in this occasion, but if it’s of the same flavour as your usual ones, where you call people “idiots” because they don’t share your same view (or worse because they offer different, hard evidence), well believe me you will have a hard time in any public forum or community. Stop hating people mate, life is good! The $0.1914/kWh for industrial sized applications I understand to be sans subsidies. As is the $0.15/kWh for large scaled plants. The ‘as much as’ $0.15/kWh that the nuclear industry states, it that with or without government subsidies? In particular are the cost of government loan guarantees and government provided large scale liability insurance included in that 15 cents? Yes those are all real costs without weighing in any subsidies, which is why I think the original study didn’t make much sense in proving the scope for PV. You can read Solarbuzz’s method on their website (they state: “No solar energy rebate programs have been built into the data”), as to the 15 cents for bigger plants, I deduced that number by considering the proportion in capital costs between 100kW systems, Solarbuzz’s choice, and that of bigger plants (the LCOE formula is proportional to that number, therefore proportions can be made). The nuclear costs claimed by the Italian Nuclear Association are also real costs, which is why I considered it a very important acknowledgement, as too many people around still scream those old numbers coming from old plants, rather than focusing on what’s coming now. I am not sure if loan guarantees and insurance have been considered, as they are “US thing”. If you try and read / translate the official note in the links, you’ll see it only suggests that is the price utilities have evaluated for new nuclear plants. Quite an impressive escalation! The original piece by Blackburn and Cunningham that stirred the pot, as I read it when it came out, was speaking to the State of North Carolina. It stated that solar was the best choice for NC at this time, partly due to the existence of federal subsidies. Seems to me that many people took that article out context. And I wonder what the levelized cost for PV solar would be were one to crank the numbers using First Solar panels ($0.76/watt) and Bosch-Rexroth mounting system (which is designed for thin film). Indeed such study was taken out of context by many, because of its powerful title. Nonetheless, what I tried to stress is that it doens’t even give a good insight in the reality of PV, as things are moving fast for bigger plants, where costs are now quickly getting competitive. A First Solar multi-MW plant will probably achieve some further 20% savings in capital costs and therefore in kWh costs, or even more. The only negative point is that their systems have a shorter operating life, as their panels are taken off for recycling after 20 years (this service is included in their purchase price). AIN doesn’t say anything more than reporting expected costs from utilities, claiming they are the real costs before subsidies (which would lower such figures). in may 2010 i installed a 3 kwp monocrystalline on my roof . cost of the plant 13000 euro. it will benefit of the state incentives for 20 years (42cent/kwh). the average italian production is 1400 kwh each kwp. therefore it will produce 1400 kwh x 3 = 4200 kwh/year . the plant production in 25 years will be : 4200 kwh/year x 25 = 105000 kwh. the cost of kwh 13000 euro : 105000kwh = 12,4 cent/kwh. the estimated production is 35 years, so let’s consider the rest as maintenance and loss of efficiency. the cost of a thin film (cis) 100kwp plant is 240 000 euro (state incentive), the annual production 140 000 kwh and in 25 years it will be 3 500 000 kwh. if you don’t want to benefit of the state incentives, you can buy and install a 3 kwp plant for 8000 euro plus mounting system and the cost of kwh will be around 8 cent/kwh. Some things are not quite right in your calcs. First, you’re over-simplyfying costs and energy production: your system will decay over time at a predictable rate for one thing, plus you haven’t included any maintenance cost, nor the cost of finance if you by your system with borrowed money. The LCOE formula takes these and more items into account, to provide a proper comparable figure between very different systems. Second, by definition costs with the help of incentives should be less than without such help, not sure what you mean there with your numbers. As for the €240k price tag of a 100kW plant, I should be able to come back on it in the near future, but so far it seems overly optimistic to me (although we are not far off from reaching it).